The Baseball Analysts: How Nasty Was that Pitch? How Nasty Was that Pitch? Every year Sportvision and MLBAM fine tune and make additions to their already excellent pitchf/x system. This year is no different. Mike Fast covered this year's changes over at the Hardball Times, and I wanted to expand on a couple points. Some of the changes involve tweaks to the classification algorithm. It looks to me like the algorithm is classifying more two-seam fastballs (also called sinkers) and doing a pretty good job of it. They have also added some pitch types. Mike noted the knuckle curve, and they also added a Eephus pitch (thrown by Vicente Padilla) and the screwball (thrown by Daniel Ray Herrera). Another addition is the 'nasty' metric that MLBAM has attached to every pitch. I wanted to check out what makes a pitch nasty in the eyes of MLBAM. 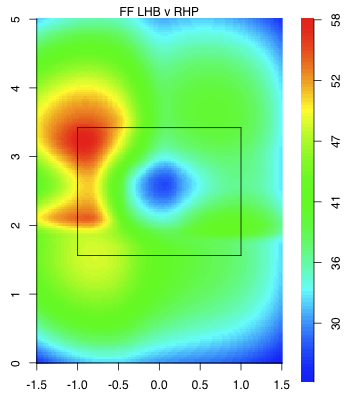 As Mike noted the nasty metric does not seem to be related to the speed or movement of a pitch, but the big determinate, it looks to me and Mike, is pitch location at least for fastballs. 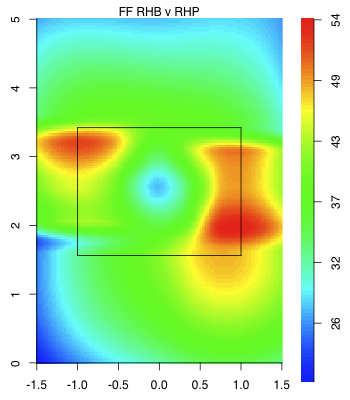 Here is a smoothed average of the nasty-ness of four-seam fastballs by location for RHBs versus RHPs. Here is LHBs versus RHPs (the other two are here and here). 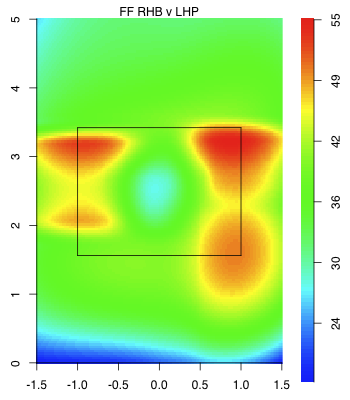 It looks like nasty score varies widely by pitch location, with those pitches far out of the zone or down the middle of the plate having the lowest score and those around the edges of the zone the best. Particularly pitches down-and-away, up-and-in and to a less extent those up-and-away have a very high nasty score. 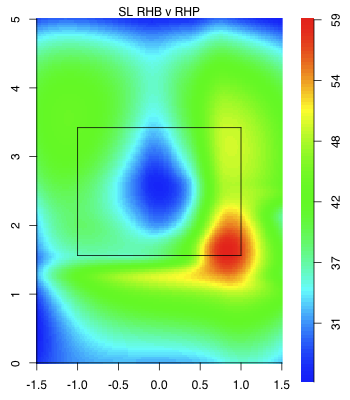 These values match up very well with the run values by pitch location that I showed about a year ago. 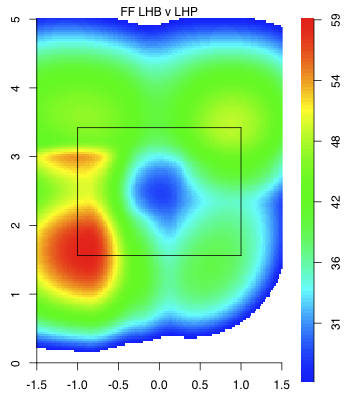 So it looks to me like the nastiness of a pitch is a measure of how hard the pitch is to hit based on its location, with nasty pitches in a hard to hit location and a non-nasty pitches either in the fat of the plate or a clear ball. Overall I think this is a nice addition to the pitchf/x values for the casual Gameday watcher. The speed of a pitch is something that is easily understood and even the movement, although less than the speed, can be put in context (that fastball had a lot of 'rise). 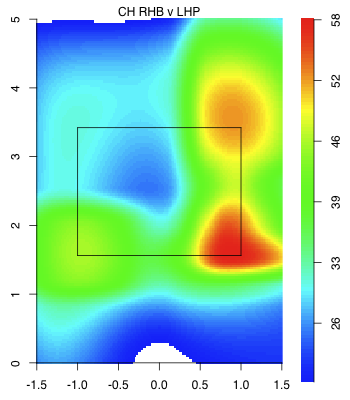 The nasty value helps to put the location in context, "that pitch was in a hard to hit location."